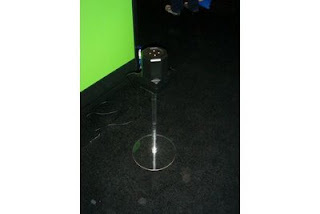 While "A game system not to be mentioned-AGSNTBM" has stolen the spotlight from most exergaming devices, the company Sixense has been working on their six degrees of freedom (X,Y,Z, pitch, roll and positional changes) controller called TrueMotion. TrueMotion is aptly named as its higher accuracy of motion sensors enables better interactivity and all of us in exergaming are anticipating this new technology to filter down to the consumers. Watching the demo it performed in a lot of ways similarly to the Motus Darwin device (featured in May - Motus website) in that the device was able to capture six degrees of freedom. However, from my personal demo of Darwin I don't remember whether or not it detected my whole-body lateral movements as well as TrueMotion appears to. 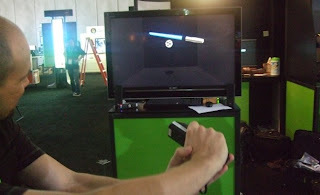 I must say that after seeing the close up images of TrueMotion I can't but help rave about Darwin's incredible design, comfortable grip, placement of buttons and of course the ability to lock two controllers together for easier gameplay of golf and every game player's dream...Star Wars Light Sabers. For now since both devices are in development, they are using wireless USB frequencies of unknown specification; however, as game developers and the Big 3 start to incorporate them they'll eventually be integrated into game consoles. Now you may say to yourself what's the difference between the TrueMotion and the recent Nintendo add-on dongle MotionPlus (for the Wii-Mote featured earlier)? One is the magnetometer which provides six-degrees of freedom for the TrueMotion 3D vs adding on a dual-axis (X,Y) gyrometer (Invensense's IDG-600 MEMS) for MotionPlus. Take special notice at around 6:15 into the video to see what two TrueMotion input devices look like while playing the soccer goal-keeper mini-game. 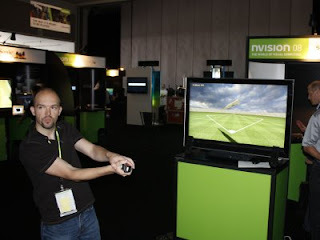 Jeff, CTO from Sixense, even suggests putting two other controllers on the feet to enable more whole-body movements and real kicks like other games (Shootball, Exertion Interfaces). Check out after the jump for more Sixsense pics and videos. 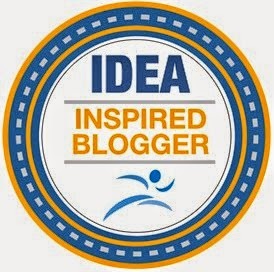 A few days ago, BodyMedia, the company known primarily for research devices that measure physical activity just released the first direct-to-consumer lifestyle and calorie management system. GoWear fit's squarish armband is coordinated by a wrist display and online management profile. I've been using the Armbands for about four years now, and I'm always happy with how easily the devices operate and how well the software is integrated with the hardware and the ability to view and sort the data according to my needs. Like another accelerometer-based device featured earlier (FitBit), GoWear appears to be the second all-in-one device and management system for a healthier life. Can't wait, can't wait to try one out. Prices with a wrist display look to range from $259-$299 (varying online subscriptions lengths). Now before you start prepping your "Bike Band" (you know, Rock Band on a bike) video, it should be noted that according to Creativity Online, this video was created by ad agency, Droga5, and not just a couple of suburban teenagers with too much time on their hands. Watching this little experiment which I can only explain as cool on many levels, I can't help but be excited for our emerging field of exergames and egames. Undoubtedly, with the dropping costs of all sensor technologies (apperently the costs of the triaxial accelerometer in Wii Motes is around $1 - when bought in massive quantities) more projects like this facially detected music game/activity will surface. 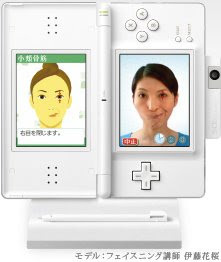 The concept for this facial game is actually pretty close to the Nintendo's tona No DS Kao Training - AKA Face Training DS. The main difference is the guy developed code to interface with the EMG sensors placed on his face and then mapped them to specific sounds. Think of it as creating or using unique sounds on your keyboard and then designating a key to play that sound. The only difference being the sensor must be activated (muscle movement) to work. WIBC 1 (Wouldn't It Be Cool) - Exergame Idea 1: Wouldn't it be cool to see an interface that is EMG activated for the Music Catch game I posted earlier. An interface of this type would be a great application of technology for individuals with spinal cord injuries and or quadriplegics. Imagine being able to move characters or perform actions while using facial gesturing. Wow, now that Tom Clancy's EndWar game (Ubisoft) is released, imagine giving the verbal commands to send troops into battle then as the action begins using the "InterFace" (pardon the pun) to launch weapons and move. Check out after the jump for more videos of Face Training. 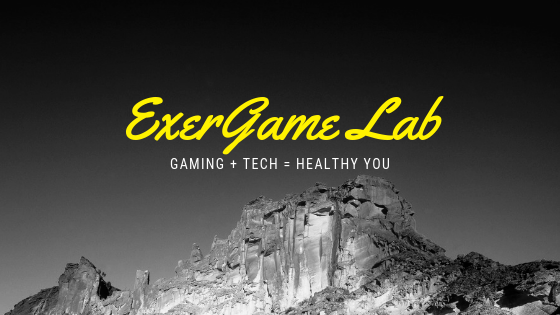 WIBC 2 -Exergame Idea 2: I can foresee a whole body interface that may even be related to muscle activation and fiber recruitment. In fact there are companies developing newer interfaces beyond the typical stepping and/ including IA Labs which is developing near isometric contraction sensors on new game peripherals (Wii Sqweeze) for different platforms and software. The 2008 SUNY Cortland PE Mini-Conference went really well thanks to the many students, faculty, and staff that helped to organize and run the workshops. Thank you to my students Chris Mekelburg, Jake Weaver, and CarolAnn Samolduski, and Matt Minnis for preparing activities and handouts for all session participants. I would also like to thank Richard Coshott (Gamercize, UK), Dan Botwick (Wild Planet Entertainment, Inc.), and Aaron Hart (Sportime) for their generous support in providing the equipment used during this workshop.